It seems that Madrid is becoming a hotspot for transforming, shape-shifting apartments. The All I Own House from PKMN Architectures recently showed off its ability to change functions with simple movements of sliding chipboard components. Now TallerDE2 Arquitectos has unveiled their own version: the Pop-Up House. The architects began work on the project in March 2013 and finished in May 2014. During that time, the existing mid-20th century apartment was basically gutted. Interior walls were torn down, fittings and fixtures were removed, and in their place chipboard units inspired by rolling trunks were installed. Each of the 54 modular units has a specific purpose. They do not slide around the floor into different positions; rather, they unfold to reveal their functions. The resident is a single man in his 30s, and because he can only use one part of his apartment at a time, the setup makes sense for him. The trunks fold out or down to reveal kitchen appliances, a TV, a bed, plenty of storage space, and even windows to see through to different parts of the apartment. The small home has a total area of 737 square feet, but the architects say they increased its usable space by 27 percent with their unique renovation. While we love the extreme functionality, the plain chipboard construction leaves something to be desired aesthetically. The Pop-Up House is not only an exercise in increased functionality; it is, according to the architects, a glimpse of the future. 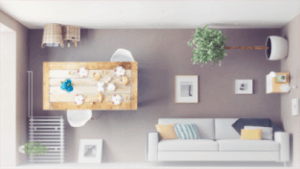 With so many people in industrialized nations opting to live in single-person households, living spaces will inevitably continue to get smaller and smaller. Solutions like this one will allow residents to live in tiny homes while still enjoying the functionality of a traditional apartment.